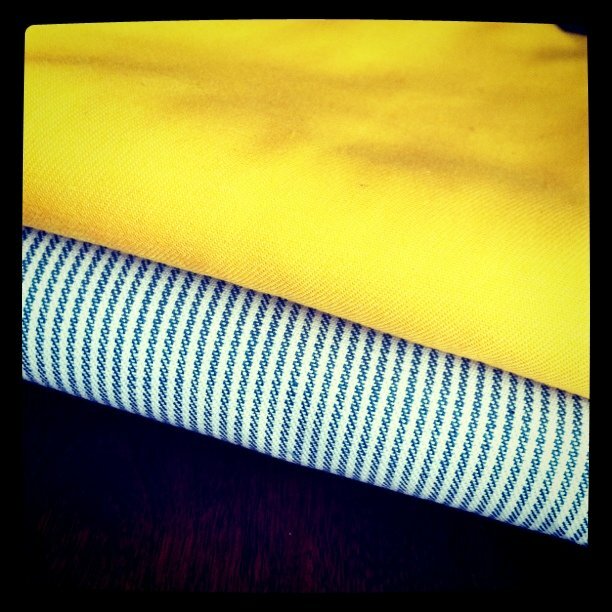 Today I began sourcing fabrics for my summer line. I know, I know, I haven't even officially launched the Wedding Line, but I have to wait for some supplies to arrive before I can do that. So, while I wait, I'm going to head to local fabric shoppes to see if they have what I'm looking for. I already have a clear idea of what I want the summer line to be about. I want to offer some lovely bold fabrics as well as some fresh prints. I bought two fabrics today that encompass the look/feel that I'm going for, and this was only day one of my search! I'm really excited to begin working with them and to find a few more fabrics to complete the line! I will have to wait a wee bit, because the Wedding Line needs to be finished first, but hopefully these gems will make an appearance in the shop mid to end April! Will always love yellow, everywhere and on anything. Just discovered your blog through Coco + Kelley, would be lovely if you stopped by mine sometime. I love all the pinks and Greys in your shop right now. Very nice. Guest Blogging at Little Alouette!